Isn't he just the cutest? Go check out the rest of the set at the Bugaboo store! 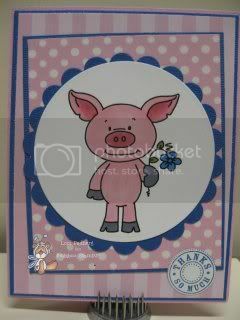 Awww, what a cute pig! What a cutie patootie piggie! Love it! Thanks for joining us for our last Stamps R Us challenge! Adorable is correct Lori!! simply ADORABLE!! thanks bunches for playing along with this weeks challenge at Simon Says Stamp and Show!!! I saw your pretty card at Make It Monday & had to come by for a closer look! I love the little piggy you've used! PS I have candy if you're interested!